Get to know how healthful diabetic eating can help take good care of yourself. Also it helps you to know what to eat, how much, and when to eat. 1- Making wise food choices. 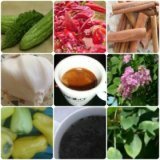 At the same time, this will help you to stay at a healthy weight, and lower your risk for heart disease, stroke, and other diabetic complications . 2- Get enough physical activity. 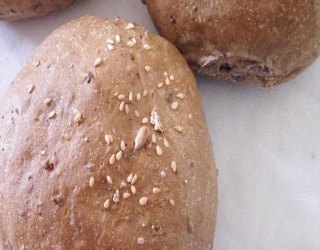 4- Buy whole grain breads and cereals. Some examples are: whole grain breads, bran flakes, brown rice, and whole-wheat pasta. 5- Eat fewer fried and high fat starches, such as pastries, and biscuits. Fresh small fruit is the best choice. If buying canned fruit, always look for the words ‘canned in its own juice’. 6- Drink fruit juices in small amounts. Water is the best. 8- Choose mustard instead of mayonnaise on a sandwich. 9- Use vegetable cooking oil spray instead of oil, butter or margarine. Baking, broiling, boiling, stir-frying, roasting, steaming, stews and grilling are the good cooking techniques for you. 9- Avoid using large amounts of oil in cooking foods. Always choose low-fat cuts of meat such as: chicken, turkey. Trim off the extra fat when buying pork, beef and ham. Choose skimmed or low-fat (1%) milk. 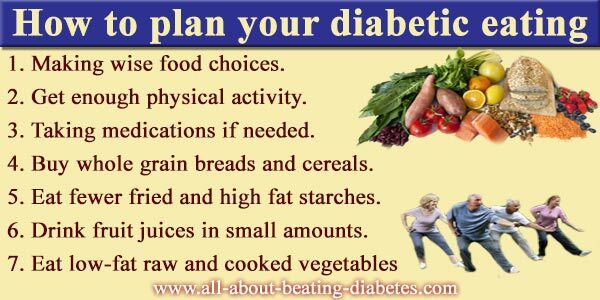 Taking all the above instruction into account, will give you ideas on what food to put and get your best diabetes diet.